We stayed for 2 nights and we experienced a fantastic staff that genuinely wanted to make sure we had a great time in Chania. Thank you, well done with honours! 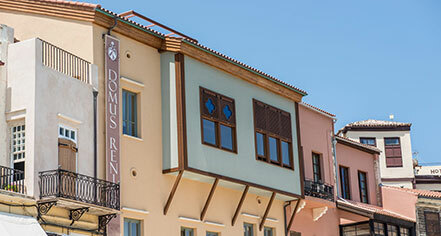 Hotel is also wonderfully renovated at the Venetian port. I strongly recommend this place. We booked a long weekend in this hotel and it was a wonderful place to stay. We booked the masters suite which is actually a two bedroomed suite. It's an amazing location as this is a very historical building but they have created the most modern of rooms with its very own private balcony. It had a jacuzzi bath and the bedroom was so comfortable. The staff from the moment we arrived could not have more engaging, there to help at every corner. All of the staff seemed to know us by name and made so much effort to make us feel welcome. We enjoyed this hotel so very much and the amazing location simply made it the perfect base for our city break location. It would be hard to overstate how positive was our experience at this beautiful hotel. We stayed six nights in February in a classic double room; such rooms do not all have a sea view, but ours did--a lovely view overlooking the historic harbor and the lighthouse. Owner Litsa Paraskevaki and her team that we got to know--Noni, Evangelia and Chef Vassilis--all were extraordinary in their warmth and kindness and in their gracious sensitivity to our needs and preferences. My wife has some dietary issues, which we failed to tell the hotel about in advance. But without our even asking, Chef Vassilis made fresh gluten free rolls for her each morning. Breakfast is magnificent, all made to order from a complete menu. Everything was fresh, beautifully presented and delicious. They offer a full range of specialty coffees (I had cappuccinos each day) but, as a coffee lover and early riser, I appreciated the Nespresso machine in our room, as well. There were so many lovely touches, such as sweets and a liqueur available 24/7. The staff was eager to give us guidance about places to dine and shop. They were always attuned to whether we wanted help or just to be left on our own. The entire staff was so very kind and thoughtful. We left feeling like part of the family, with hugs and kisses on the cheeks as we said our farewells. We would love to return to Domus Renier and we recommend it unreservedly. We are always suspicious when going to a high standard hotel afraid that we will not fit in. After meeting 5 of the staff we were almost feeling like one of the family. Professional of course but warm and easy to speak with. All the excellent recommendations they are given are well earned. Perfect room with view over the harbour. Unfortenately they could not change the weather. 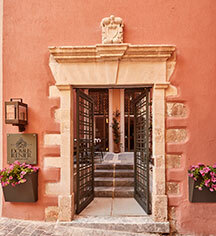 We loved our stay at this boutique hotel. The friendly, warm and helpful staff was above and beyond and genuine. The location was perfect. The breakfast was so delicious and truly gourmet. Our room was beautiful and we will forever remember the beautiful blue windows. The first picture the view from our room and the second of the beautifully restored room. Even when the weather was less than ideal we had a fabulous romantic weekend.